In recent times those African nations which have oil have benefitted from bumper prices while those without it have suffered chronic inflation and in some cases social unrest. Yet crude oil’s latest price collapse totally reverses the situation. 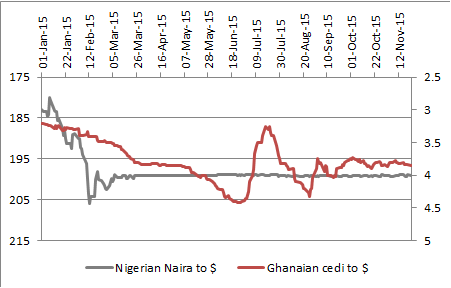 Nigeria is a prime example here and its currency has plunged alongside the oil price. Elsewhere, metal prices are a huge influence on South Africa's economy, which continues to wrestle with industrial unrest, a sliding currency and chronic national infrastructure problems. Geopolitical conflicts further cloud the picture for a continent which still has huge long-term potential, thanks to its resource wealth, flourishing population and technological progress, as exemplified by how many nations have ignored traditional wireline telecommunications networks and gone straight to mobile. Chaos in Libya and terrorist attacks in Tunisia and Mali leave the continent on high alert. Conflicts that are strictly political rather than religious in nature are an added complication. Burundi is wracked by a power struggle and the United Nations has even threatened sanctions as President Pierre Nkurunziza seeks to override the constitution and run for a third term in office. Other leaders who seem keen to prolong their grip on power beyond their current legal limits include Denis Sasso Nguesso, President of the Republic of Congo, the Democratic Republic of Congo’s Joseph Kabila and Paul Kagame of Rwanda. At least the Ivory Coast’s President, Alassane Ouattara, clinched a second term with a landslide election win in 2015 in a legitimate fashion. Meanwhile Nigeria’s Goodluck Jonathan came a cropper at the polls this year. Muhammadu Badari swept him out of office amid widespread discontent with the economy’s performance and corruption. Broadly speaking it is possible to break Africa’s economies into three main categories. The first are the labour-abundant countries which are producers and exporters of oil and gas and have large native populations, which represent almost the totality of their residents. This group of countries includes Algeria, Angola, Equatorial Guinea, Gabon, Nigeria and the Republic of Congo. The second are labour-importing countries which are producers and exporters of oil and gas and have large shares of foreign or expatriate residents, who represent a significant percentage of the total population, even the majority in some cases. This includes Libya. The final group is those countries which are small producers or importers of oil and gas. These countries include Botswana, Cameroon, Côte d’Ivoire, Democratic Republic of the Congo, Djibouti, Egypt, Ethiopia, Ghana, Kenya, Mauritania, Morocco, Mozambique, Senegal, South Africa, Tunisia and Uganda. 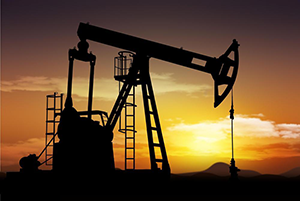 Question marks over the global economy and a build-up of US shale oil production had already put oil prices under some pressure, the plunge and OPEC’s decision in November 2014 to hold its production levels steady worsened the oversupply. Oil’s price fall is putting strain on Libya and Nigeria as they have relatively scarce foreign exchange reserves, need to support domestic spending plans and are suffering a marked drop in income. Nigeria’s currency, the naira, suffered a devaluation in 2015 and the slump in commodity prices also took its toll on Ghana, which was forced into turning to the International Monetary Fund for a near- $1 billion bailout in April 2015. South Africa’s rand plunged to fresh all-time lows against the buck, hamstrung by the chaotic situation in Africa’s most industrialised economy. Where weak metal prices and industrial unrest are also taking a toll and the economy teeters on the brink of recession. Johannesburg’s sovereign debt is hovering just above junk status and some commentators worry that national utility Eskom’s proposed $100 billion nuclear power programme could tip the country over the edge. Emerging markets globally have underperformed developed arenas for some time, as is made clear by the chart below. 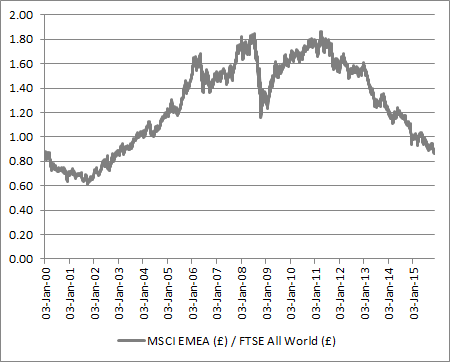 This shows the MSCI EMEA index (in sterling terms) divided by the FTSE All-World benchmark (also in sterling terms). When the line rises, Africa and the Middle East are outperforming and when it falls they are underperforming their global peers. Oil price rises would help Nigeria, political stability would boost Egypt while South Africa needs help on several fronts. 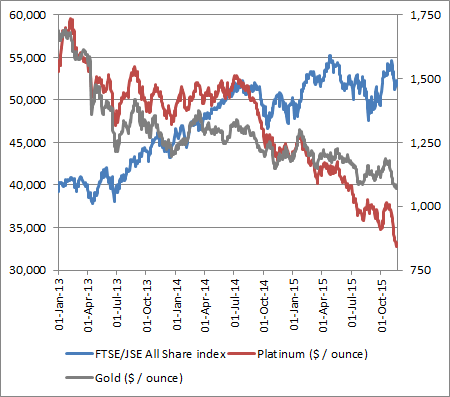 The Johannesburg market has done well as investors have sought to buy risk assets as a hedge against inflation but the FTSE/JSE All-Share index has begun to lose momentum of late. 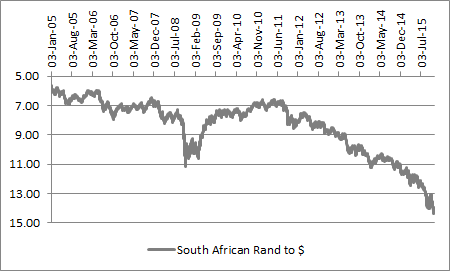 ANC infighting hardly helps the South African market, which would also welcome increases in gold, diamonds and platinum. The last-named has come under pressure following the Volkswagen emissions scandal in Europe, as the precious metal is a key part of catalytic convertors for diesel engines. AJ Bell’s free investment guidance service is based on our list of sixteen Top Trackers. One of these covers Africa, although not in a particularly direct way. The UBS Emerging Markets tracker has the EPIC code of UB32 and a SEDOL of B76HL88. It comes with a 10% weighting toward Africa and the Middle East in total as part of a broad basket of Emerging Market stock market assets. The tracker puts greater emphasis on Asia and Latin America, with weightings of 69% and 13% respectively.